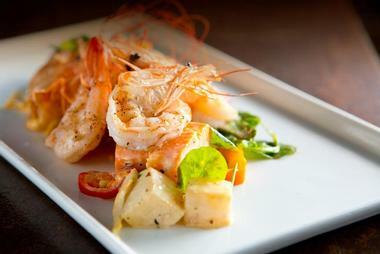 Denver offers an array of delicious choices for breakfast, lunch and dinner, ranging from casual to elegant. 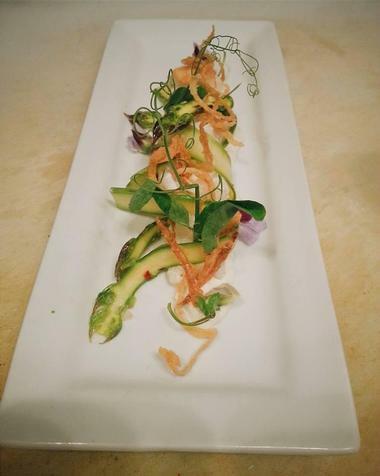 Many of the restaurants on our list pride themselves with building relationships with local farms to source the freshest seasonally available produce. Whether you are looking for New American cuisine, classic French dishes or Italian fare, here are the best romantic restaurants in Denver. 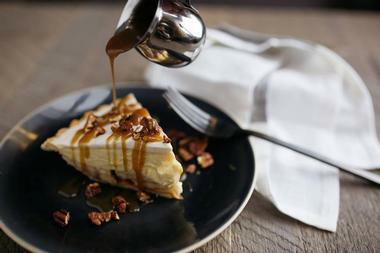 Sleek, stylish and elegantly rustic, Colt & Gray is a locally-owned and operated neighborhood restaurant serving New American cuisine and offal-focused fare. The eatery specializes in nose-to-tail utilization, with an interesting menu of farm-to-table cuisine that focuses on sweetmeats and offal dishes, including award-winning bone marrow. Colt & Gray offers multiple private dining event options ranging in size from two to 250 guests and sometimes offers a brunch menu. Situated below LoHi, Colt & Gray has a bar that begs to be frequented over professionally executed cocktails, fine wines, and a range of golden craft beers. Colt & Gray is one of the best romantic restaurants in Denver. Beast + Bottle is a cozy sibling-run eatery in Denver’s Uptown neighborhood that serves seasonally inspired farm-to-fork fare in a menu that travels from Colorado to Maine to Italy to North Africa in each of its dishes. Expansive, quirky and worldly, the restaurant’s simple off-white interior is warm and welcoming, drawing crowds to its comfortable dining room and a lovely patio to savor some excellent farmhouse-inspired New American cuisine, such as Porchetta di testa and the vegetable soufflé. A unique three-sided bar serves unusual wine varietals and little-known grape varietals such as Spätburgunder, and intricate cocktails. Beast + Bottle is open for dinner, Monday through Sunday, and lunch and dinner on the weekends. Fruition Restaurant is a tiny eatery that has been drawing foodies from around the world to experience Chef Alex Seidel's refined farm-to-table New American cuisine. Drawing inspiration and naturally sourced ingredients from his 10-acre farm in Larkspur, Seidel’s seasonal cuisine is both simple and sophisticated, with rich, earthy flavors and tastes. 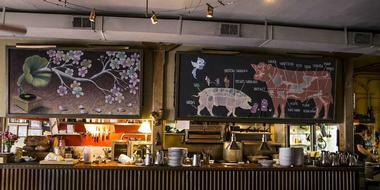 Old Major is a rustic-chic restaurant that specializes in farm-focused, pig-centric, nose-to-tail fare. 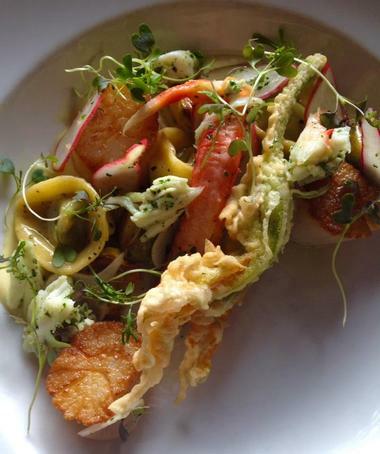 Located in Highland, Chef Justin Brunson has worked hard to bring diners a place dedicated to “seafood, swine, and wine”. An in-house butchery and rock-solid charcuterie program produces artistically astounding dishes, such as the twenty-one-day dry aged, bone-in rib eye served with foie gras-butter and the nose-to-tail plate, which features pork chops, confit rib, and crispy pork belly. Boasting a comfortable and casual atmosphere, a table can be hard to come by; however, amiable bartenders will keep you entertained at the bar with an array of fine wines and cocktails while you wait. Steuben’s Food Service is a Denver-based eatery that serves classic regional American cuisine from a retro-style diner. Run by Wolkon and his wife, Jen, this unique eatery presents everyone's favorite regional classics, such as pot roast, New York strip steak, and meatloaf. Diners can enjoy nightly specials throughout the week, as well as Happy Hour food and drinks specials on certain evenings. 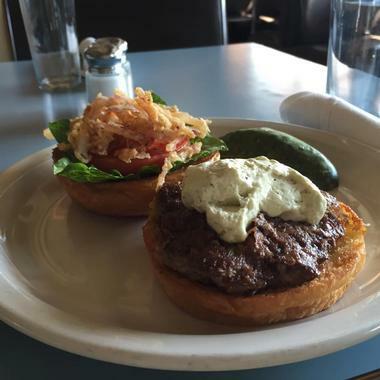 Steuben's cuisine is also available from their food truck, which can be found at locations around town. 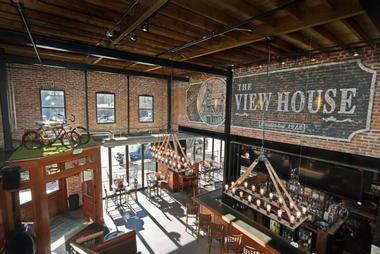 Located in Denver’s Ballpark next to Coors Field, Viewhouse is a popular bar and grill occupying a three story building with a spectacular rooftop deck overlooking the mountains, and more importantly, the ballpark and the ongoing games. Viewhouse is known for its endless themed parties such as Silent Disco Yoga, but also for a fun, lively atmosphere, popular pub grub redefined by chef Jose Guerrero, plenty of beer on tap, and great cocktails. It is the place where you can bring your kids to watch the game from the rooftop or bring a date in the evening to sip cocktails by a fire pit. Corinne is a modern cocktail lounge/bar/restaurant just off the lobby of the upscale Hotel Le Méridien in downtown Denver. With comfortable leather sofas and armchairs, small marble bistro tables, and a fire pit, it has a relaxed, stylish bistro atmosphere. The food is Modern American with French touches – try jumbo shrimp Louie or Bacon-Wrapped Filet with bleu cheese crust, served with mashed potatoes and broccolini in beef jus. Corinne is the perfect spot for a power lunch – it is even advertised as “Enjoy lunch in 45-min or it's free!” The fully stocked bar attracts an after-work cocktail crowd but it is also a perfect spot for an afternoon tea with a piece of apple strudel or banana cream pie. Guard and Grace is a modern, elegant, and upscale steakhouse located in the lobby of the CenturyLink building in downtown Denver. It is the place where the power lunch crowd comes to wine and dine clients, but also the place for a celebratory dinner or a romantic encounter. The décor is sleek, with deep colors, a huge piece of wall art, and a beautiful outdoor patio. The food ranges from superb steaks and options from a large raw bar to delicious sandwiches. The extensive menu offers something for everyone. A very respectable wine list has a number of wines offered by the glass, and the bar makes classic but also fun and interesting cocktails. Serving award-winning Italian food in downtown Denver, Panzano lives by their motto of: “Those who eat well, live well”. 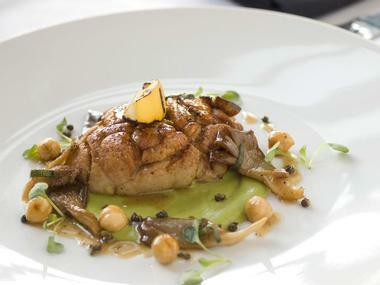 Located at Hotel Monaco in a comfortable and elegant dining room with cozy booths, Chef Elise Wiggins’ menu features creative dishes inspired by Northern Italy, such as Crespelle ai Funghi (crépes with mushrooms and white truffle oil) and Capesante (scallops with spinach and ricotta). Snooze is a bright eatery that aims to add an element of fun and energy to morning meals through great food, excellent service, and a casual, friendly atmosphere. 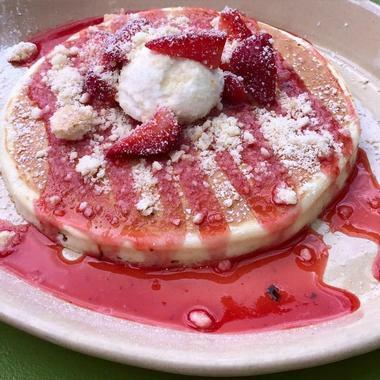 Founded by brothers Jon and Adam Schlegel, Snooze serves a menu of delicious breakfast foods with a creative twist, from pancakes with marshmallows to Eggs Benedict, omelets, and heaps of huevos rancheros. Residents, families, and friends line up to get their slice of morning pie, enjoying free coffee while they wait. Housed in what used to be an old gas station, Bittersweet is owned by Olav and Melissa Peterson, who have breathed new life into the old building and created an intimate and comfortable eatery. Two dining rooms with high ceilings are adorned with Melissa's artwork, old maps, and plush chairs, and indoor/outdoor fireplaces which add to the cozy ambiance. 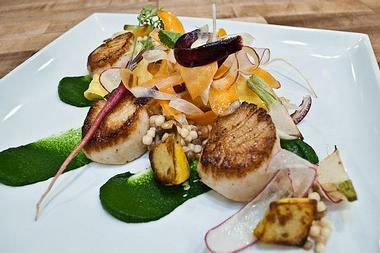 Bittersweet serves a garden-to-table menu based on classic French cuisine that changes seasonally and gives old favorites a new twist. The Wagyu Hangar Steak is served with chanterelle mushrooms and a bone marrow sauce, while the Scottish Salmon is accompanied by octopus, mussels, clams and purple potatoes. Barolo Grill in Cherry Creek North is renowned for serving homemade cuisine from Tuscany and the Piedmont region of Italy along with delicious wines in an elegant and stylish setting. Owner and wine director Ryan Fletter is also proud to feature small family wineries that are dedicated to sustainable farming and winemaking philosophies, boasting one of the largest collections of Barolo wines outside of Italy. Barolo offers patrons two ways to dine: an a la carte or a prix fixe, five-course tasting menu, packed with unexpected combinations, such as risotto with escargot. Potager (meaning ‘garden kitchen’) is just that – a little garden restaurant that serves a seasonal, garden-driven menu in a rustic setting. Chef Teri Rippeto's menu is a perfect example of cooking and eating in concert with the seasons, where dishes are prepared with locally sourced, market-fresh ingredients (produce is listed along with the name of the farmer on the menu). Choices include lamb meatballs, pan-roasted mahi-mahi, and wood-fired herb chicken, with sides like roasted farm radishes, soufflé, and spring greens and nettle minestrone. Add to that comforting service, and a warm, home-away-from-home setting, and you have the makings of a perfect meal. Serving creative, locally sourced farm-to-table fare in a warm, rustic space, Duo is located in the heart of Denver’s hip Highlands neighborhood. Boasting a relaxed, unassuming dining space that captures the true essence of the corner restaurant, owners Stephanie Bonin and Keith Arnold bring diners a menu of seasonal cuisine made with ingredients supplied by more than forty local partners. From a delicious brunch menu featuring chocolate French toast and ‘zippy cake’ – a unique sausage grit cake dripping with caper brown butter – to a dinner menu featuring Boulder lamb and rabbit, desserts are a must-try. Lola is a very popular Mexican fish house where locals and visitors go to unwind and meet friends. 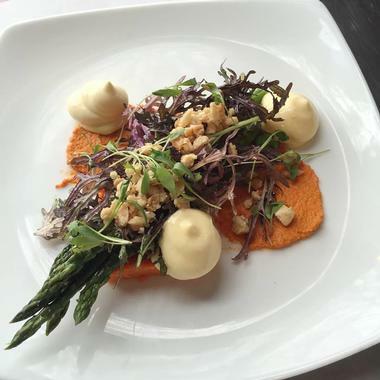 Savor some of Lola’s famous small plates and grab one or a few of their favorite margaritas. Happy hour is the best time to visit, not only to see and be seen, but also for the special tacos and Lola’s made-at-the-table guacamole. The large menu has all your favorite Mexican treats with a focus on seafood and fish, but the chefs are free to use their inspiration and artistry to surprise you with their own interpretations. Lola’s inspiration comes from the coast of Mexico, but the fresh ingredients for delightful food are all from Denver and surrounding areas. Make sure to check out their lovely outdoor patio. 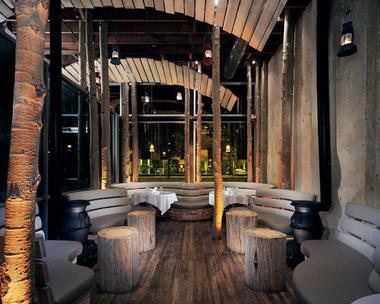 Inspired by the wilderness of the forest and the solitude of the city, Beatrice & Woodsley bring the beauty of the Colorado wild into the city with a woodsy, playful setting in which guests can savor creative New American cuisine and innovative cocktails. Owner Kevin Delk established the restaurant over ten years go with the goal of enticing diners who were looking for a unique dining experience and still stands by this principle today serving elevated dishes and upscale libations. The elegantly romantic spot serves signature entrées such as duck leg confit, braised lamb shank, bouillabaisse, bubble and squeak, and pork shoulder, along with freshly prepared salads, appetizers, desserts, and a hand-curated wine list. Beatrice & Woodsley is open for dinner Monday through Sunday, and brunch over the weekend. 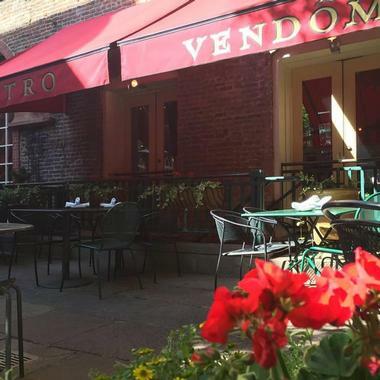 Bistro Vendôme is a traditional Left Bank-style café with a beautiful garden that serves slightly modern twists on classic French cuisine and the closest you’ll get to Paris in the heart of Denver. Located in the famous Larimer Square, the charming café is run by chef Jennifer Jasinski and business partner Beth Gruitch and serves an alluring menu with timeless classics like escargot, onion soup, and steak frites, along with modern, seasonally driven creations. Surrounded by brick walls, ivy, and shady trees, the bistro offers a quiet oasis in the midst of the bustling Larimer Square where diners can enjoy some happy-hour bubbly, a brunchtime croque madame, or a three-course French dinner in a friendly and warm ambiance. 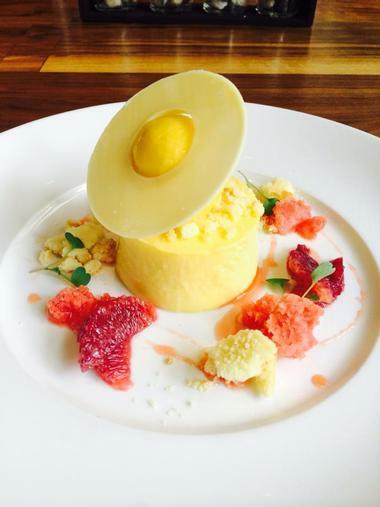 Bistro Vendôme is open for dinner Monday through Sunday, and brunch over the weekend. Overlooking the bustling Larimer Square in downtown Denver, Rioja is a warm Mediterranean eatery that serves a menu of locally sourced, inventive Mediterranean dishes and globally-inspired wines in a vibrant dining space. Strung lights and handsome brick buildings create a fitting backdrop for the James Beard Award-winning crown jewel on the square and one of the pioneers of the Denver restaurant scene. Boasting indoor and outdoor seating overlooks the square, the elegant restaurant oozes style and sophistication with a menu to match featuring handmade pasta such as black garlic-squid ink bigoli, artichoke tortelloni, and saffron cavatelli with lobster, as well as hearty entrées like Wagyu bavette steak; spice rubbed lamb loin and Serrano ham-wrapped octopus. An extensive wine list provides an excellent selection of pairing partners to the cuisine. Rioja is open for lunch Monday through Friday, dinner seven nights a week, and brunch on the weekend. 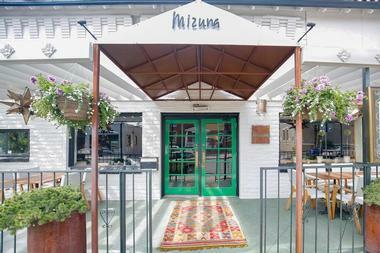 Hailed as one of the top restaurants in the city, Mizuna is an intimate neighborhood joint helmed by Chef Frank Bonanno who presents a creative menu of New American cuisine paired with fine wines in an elegant setting. Bonanno and his culinary team experiment and explore the finest locally sourced and seasonal ingredients to create an ever-changing menu firmly rooted in French cooking techniques with dishes that reflect the bounty of each season on both land and sea. The restaurant boasts a relaxing ambiance with linen-draped tables and soft yellow tones where diners can savor exquisite dishes such as Foie Gras Pie, Burgundian Escargot, Smoked Spanish Octopus, and Seared Yellowfin Tuna. A signature selection of fine wines accompanies each course, with suggestions given by the professional and friendly staff. Mizuna is open for dinner only, Tuesday through Sunday. Table 6 is a classic American bistro with rustic interiors, an open-plan kitchen, and friendly, welcoming staff who serve the menu’s simple and elegant dishes. 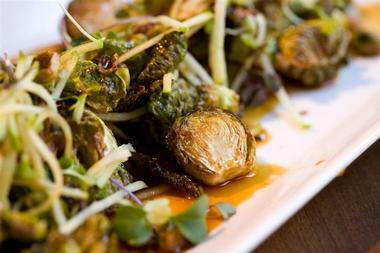 Chef Mike Winston focuses on creating modern comfort food with eccentric touches while owner/sommelier Aaron Forman pairs the dishes with excellent wines from around the world. Table 6 offers a relaxed, casual, and utterly comfortable atmosphere, perfect for a date or a meal with friends. The Populist is all about communal dining and sharing experiences with friends. Set on a quiet stretch of Larimer Street in RiNo, the Populist has been drawing diners into its bright red dining room and copper bar since 2012. 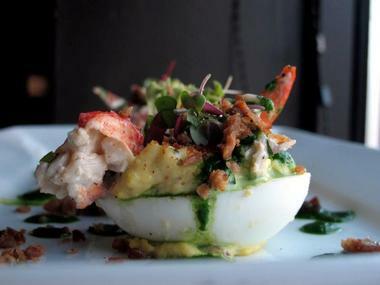 The eatery serves a regularly changing menu of New American small plates that are meant to be shared. Journey from France to India as you make your way through Chef Jonathan Power’s delicious dishes. Grab a seat at the gorgeous copper bar, or join the conversation at one of the buzzing communal tables. Combining old world flavors with classic French culinary techniques, Vert Kitchen is a French-inspired deli that serves gourmet sandwiches using sustainable meats, dairy and some of the finest pantry goods in Denver. 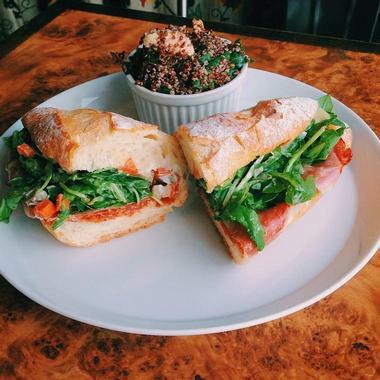 Patrons squeeze into this tiny Washington Park West lunch-and-brunch counter for handmade sandwiches, garden-fresh salads, and delicious soups made from local and seasonal ingredients. 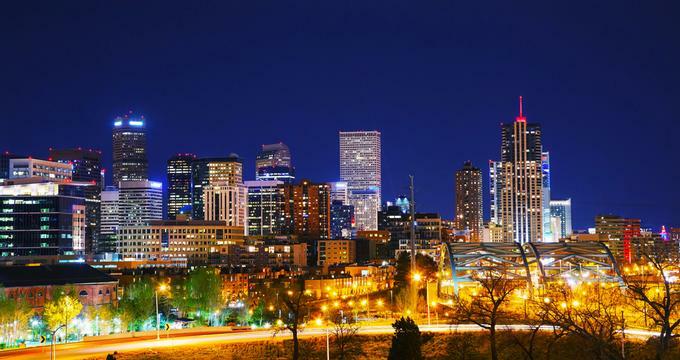 It's the perfect stop when you get tired while exploring Denver attractions. 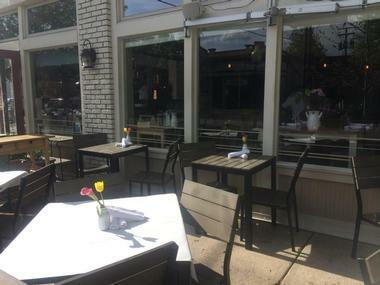 A charming back patio is a perfect sunny day spot to enjoy your lunch - try a Lemon Tuna sandwich served with cucumber and Greek yogurt or a Braised Pork sandwich, heaving with house BBQ and roasted cabbage. A good selection of wine and beer boosts the already mouthwatering menu.